Unfortunately, the Teeth Whitening Industry has been stuck for years doing the same thing with what WE consider to be below average results. You can go to any dentist office and the large majority of them will offer you the same service, same product, and similar prices regardless of the multitude of variables that come with each client. We understand that your teeth are completely different from someone else's when it comes to your current shade, sensitivity level, porosity of your teeth, age, lifestyle, diet, habits, your profession, oral care hygiene and most importantly your desired results. Each client goes through an assessment which will allow us to create a custom treatment plan for your teeth that will ensure you get the results you want. Our mission is simple: Provide every client the perfect treatment to achieve the results they want. ALL APPOINTMENTS ARE 3-4 back to back, 20 MINUTE SITTINGS USING OUR ADVANCED LED WHITENING SYSTEM-First- Decide which location you are looking for (Arizona or Utah). Decide which experience best applies to you. Our Lumina Brilliant (first time clients) or our Lumina Glow (returning clients). Once booked, we will send you a confirmation email with specific instructions on how to best prepare for your upcoming appointment. Questionnaire- Don’t worry we will go over this with you in person! We want to ensure that based on your history with your teeth , your whitening goals, and your lifestyle that the package you chose will best achieve your needs. step 2- Pre-Procedure - Get ready! Way to go! You took the next step to achieving your teeth whitening goals! Check your email for our address and driving instructions as well as specific instructions on how to best prepare your teeth for your appointment. Regardless of the package you chose , we will provide you with a custom treatment based on our consultation with you! This will include your concerns with sensitivity in correlation to your whitening expectations and decide on a treatment plan that will satisfy your goals! Once you have finished your appointment we will go over with you as well as send home take home instructions for your after care. If you are interested in our Home Maintenance System, Whitening Toothpaste or Whitening Pens, we will go over a plan to help keep your smile looking bright! You will LOVE your results, We guarantee it! This dental grade whitening treatment is perfect for anyone who is a returning client of ours and has whitened their teeth within the last 6 months. You will receive a full consultation and custom formulated whitening treatment based on our analysis. Diet, Habits, Lifestyle and Desired Results. This dental grade whitening treatment is perfect for anyone who is a FIRST-TIME client. You will receive a full consultation and custom formulated whitening treatment based on our analysis. Diet/Habits/Lifestyle/Desired Results/ are all relevant factors in your treatment. Lumina Teeth Whitening partnered with one of the top teeth whitening hydrogen peroxide manufacturers in the world. Having been manufacturing top of the line teeth whitening products since 2007 they have whitened over 1,000,000 teeth! All of our gels are formulated at various strengths depending on each clients specific needs. They are all carefully crafted into a unique formula of hydrogen peroxide and other natural ingredients focused on the highest level of whitening possible while maintaining strong desensitizing agents to provide clients with significantly reduced pain. Gels are made weekly guaranteeing the freshest product possible. I am SO excited to share with you my amazing home whitening system that I have been working so hard on for over a year! I have been very fortunate to partner with two manufacturers, one specialized for my in office treatments, and one specialized for my home whitening system! I am proud to say all my products are made in the USA. ALL ingredients are made fresh to order! There are no harmful chemicals or preservatives in any of my products. About Lumina’s Home Whitening System- With being able to have my manufacturer right here, literally a mile from my home in Utah it makes processing and handling a lot faster. As you all know, sensitivity is one of the number one concerns when it comes to whitening products. With that in mind- we have created a HYBRID formula using Carbamide peroxide and Hydrogen peroxide making our formula one of the strongest, but safest on the market today! Our formula was developed to reduce sensitivity. We use Nanohydroxyapitite, along with other ingredients, which closes the small pores of the enamel surface, and helps to restore the enamel. 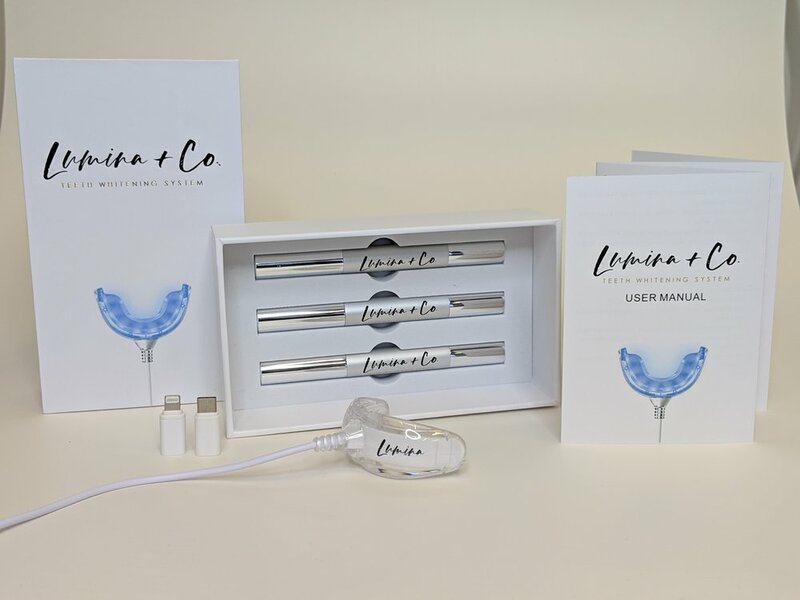 I am extremely excited for you to try your own Lumina Whitening System! TO ORDER YOURS TODAY!! Contact Brooklyn at 801.500.1027. Do you have questions about your Whitening Adventure? We'd LOVE to hear from you! Join our Lumina family on Instagram and keep watching all the amazing results!